Saint Teresa of Jesus died in 1582. Thirty-two years later, on 31 December 1614, Catherine Mectilde de Bar was born at Saint–Dié in Lorraine. On 22 July 1647, sixty-five years after the death of Saint Teresa and thirty-three years after the birth of Mother Mectilde, Margaret Mary Alacoque was born in L’Hautecour in Burgundy. When Margaret Mary Alacoque entered the Visitation Monastery of Paray-le-Monial, it was assumed that she, like so many other women, would disappear into the cloister, leaving behind no more than the sweet lingering fragrance of another life given to Christ. But, as always, “God chose what is foolish in the world to shame the wise, God chose what is weak in the world to shame the strong, God chose what is low and despised in the world, even things that are not, to bring to nothing things that are, so that no human being might boast in the presence of God” (1 Corinthians 1:27-29). The icy wind of Jansenism was blowing through the chinks in more than one cloister. It chilled the heart with the fear of a distant and vindictive God, eclipsing the mission of Jesus sent by the Father, in the power of the Holy Ghost, “to proclaim release to the captives . . . to set at liberty those who are oppressed” (Luke 4:18). While the hearts of many around her grew cold, Saint Margaret Mary fixed her gaze upon the wounds of Jesus Crucified. Like Saint John the Apostle, like Saints Bernard, Lutgarde, Gertrude, Mechthild, and countless others before and after her, the humble Visitandine of Paray-le-Monial was compelled by the Holy Ghost to look upon Jesus’ pierced Side. “They shall look on Him whom they have pierced” (Zacharias 12:10; John 19:37). In contemplating the pierced Side of the Crucified, Saint Margaret Mary discovered what many had forgotten: “the breadth and length and height and depth of the love of Christ” (Ephesians 3:18). It was given her to “know the love of Christ which surpasses knowledge” and fills “with all the completion God has to give” (Ephesians 3:19). She discovered, moreover, that the open Side of Jesus beckons to all from the adorable Sacrament of the Altar, and that His Eucharistic Heart is, at every moment, ablaze with love. Reparation, Saint Margaret Mary understood, is an imperative of love. The Side of Jesus remains open in the Most Blessed Sacrament, and men pass it by — some with a cold indifference, others with a merely formalistic token of acknowledgement, and still others without the slightest indication of grateful adoration — and among these, alas, are priests and consecrated souls. In this age of locked churches, of tabernacles forsaken from one Sunday to the next, of the Sacred Species so often handled casually and without reverence, and in the wake of public sacrileges perpetrated against the Blessed Sacrament, reparation to the Eucharistic Heart of Jesus is, more than ever, necessary. Saint Margaret Mary invites us to re-discover the Heart of Jesus ablaze with love in the Most Holy Eucharist. The Eucharistic Christ, the Christus Passus, abides in our midst as Priest and Victim. There He perpetuates the oblation made first in the Cenacle, and then from the altar of the Cross. In every age souls, like Saint Margaret Mary, have been polarized by the mysteries of the Cenacle and of the Cross actualized in the Most Holy Eucharist. In some way, the Holy Ghost continually reproduces Saint John’s icon of the Church contemplating the pierced Side of Jesus on Calvary: “Standing by the Cross of Jesus were His mother, and His mother’s sister, Mary the wife Clopas, and Mary Magdalene. . . . and the disciple whom He loved” (John 19:25-26). The Sacred Heart is at the center of the Most Holy Eucharist both as sacrifice and as sacrament. The sacred action of the Mass perpetuates the Sacrifice of Calvary by which Christ, obedient unto death, hands Himself over to His Father and to those who partake of His Body and Blood. The priestly Heart of Jesus that beats with love in the Sacrifice of the Mass where He offers Himself as Victim, lives and burns with the same fire of love in the Sacrament of the Altar. From the tabernacle, as once from the Cross, He seeks souls to console Him, saying in the psalmist’s words: “I look round for pity, where pity is none, for comfort where there is no comfort to be found” (Psalm 68:21). One cannot look long at Jesus Crucified without “the eyes of the heart” (Ephesians 1:18) being drawn to His pierced Side, and without entering, drawn on by the Holy Spirit, through the door of His pierced Side, into what men and women of every age have experienced as a “burning furnace of love.” The “unsearchable riches” (Ephesians 3:8) of the Sacred Heart of Jesus, contemplated “for now, as in a mirror darkly” (1 Corinthians 13:12), are given us, until the return of the Lord in glory, in the adorable mystery of the Eucharist. And so, we go to the altar and to the tabernacle again and again to taste “with all the saints” (Ephesians 3:18), the “perfect love that casts out fear” (1 John 4:18). June 17th marks the feast of Blessed Marie-Joseph Cassant, a Trappist monk of the Abbey of Sainte-Marie-du-Désert beatified by Pope John Paul II on October 3, 2004. Father Marie-Joseph died on June 17, 1903; he was twenty-five years old. Solemnly professed for three years, he had been a priest for only nine months. From childhood he wanted nothing else. “Where your treasure house is, there is your heart also” (Mt 6:21). Since 1903 more than 2200 persons from thirty different countries have attested to favours received through the intercession of Father Marie-Joseph. The catalogue of graces attributed to the young monk is impressive: conversions, reconciliations, cures, and comfort in uncertainties and doubts. My friend Father Jacob and I went in pilgrimage to his tomb in 1982 and prayed that both of us might become priests. I was ordained four years later. Father Marie-Joseph’s road to the priesthood was not an easy one. His parish priest judged him intellectually inadequate for theological studies. After tutoring him for fifteen months in French and Latin, he saw that the young Joseph was not suited for the diocesan seminary. 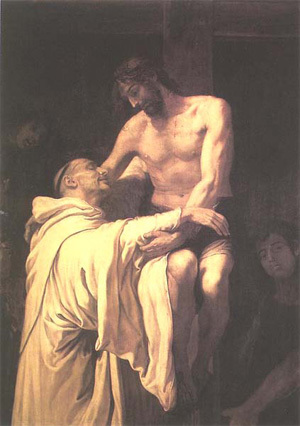 He directed him instead to the Trappe of Sainte-Marie-du-Desert where the monks were ordained to the priesthood after a simpler course of studies, given that they had no pastoral responsibilities or outside ministry. Joseph entered “Le Desert” on December 5, 1894. Sister Thérèse de l’Enfant Jésus et de la Sainte-Face, five years older than Joseph, had three years left in her Carmel of Lisieux. Their lives were in some ways similar. Although Thérèse had a stronger personality, both were led to find their strength in weakness. “More than ever, then, I delight to boast of the weaknesses that humiliate me, so that the strength of Christ may enshrine itself in me” (2 Cor 12:9). It is significant that Father Marie-Joseph belonged to the “Association of Victim Souls,” a movement of identification with the oblation of the Heart of Jesus, Priest and Victim. Saint Pius X (1835-1914), Blessed Charles de Foucauld (1858-1916), Blessed Columba Marmion (1858-1923), Blessed Jacob Kern (1897-1924), and Blessed Ildefonso Cardinal Schuster (1880-1954), were all members of the same Association. It was established by the Filles du Coeur de Jésus (Daughters of the Heart of Jesus) following the wishes of their foundress, Blessed Marie de Jésus Deluil-Martiny, after her death. As a member of the Association, Father Marie-Joseph prayed, and signed, an Act of Oblation that the rest of his life was to illustrate and consummate. in union with the Daughters of the Heart of Jesus. that Thy Providence hath sown beneath my feet. my homeland, and poor sinners, my brethren! and in union with the immolations of her Immaculate Heart. Frère Marie-Joseph was timid, fearful, and scrupulous at times, suffering from insecurities. It was by trusting obedience to his Novice Master, Père André Malet, that he began to grow in confidence in the Heart of Jesus. “My grace is enough for thee; my strength finds its full scope in thy weakness” (2 Cor 12:8). Confidence in the Heart of Jesus became his way. Echoing the words of the psalmist, he called the Eucharist “his one happiness on earth.” “What have I in heaven? And besides Thee what do I desire upon earth?” (Ps 72:25). Even in the abbey, theological studies were not easy for Joseph. The monk charged with teaching him often humiliated him publicly for his stupidity, saying, “ You are totally limited! It is useless for you to study. You will not learn any more. 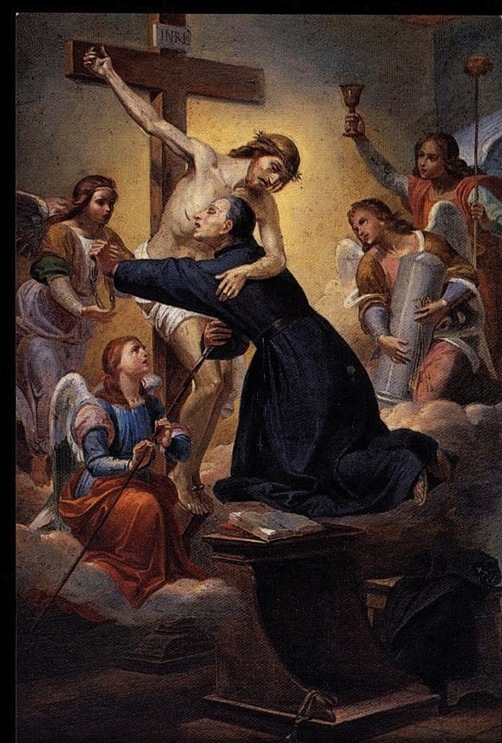 To ordain you would be a dishonour to the priesthood.” Father André, his gentle and patient spiritual father, was always there to encourage Father Marie-Joseph, to set him again and again on the path of confidence in the Heart of Jesus. Father Marie-Joseph was ordained on October 12, 1902 at twenty-four and a half years of age. Already tuberculosis was ravaging his young body. His abbot sent him home to his family for seven weeks of rest, hoping that his health might improve, but it was too late for that. Upon returning to the abbey, Father Marie-Joseph was sent to the infirmary. His lungs were irreparably damaged, his breathing difficult. As infirmarian he was given none other than the theology professor who had so harshly berated him. that He may bring us to life everlasting. 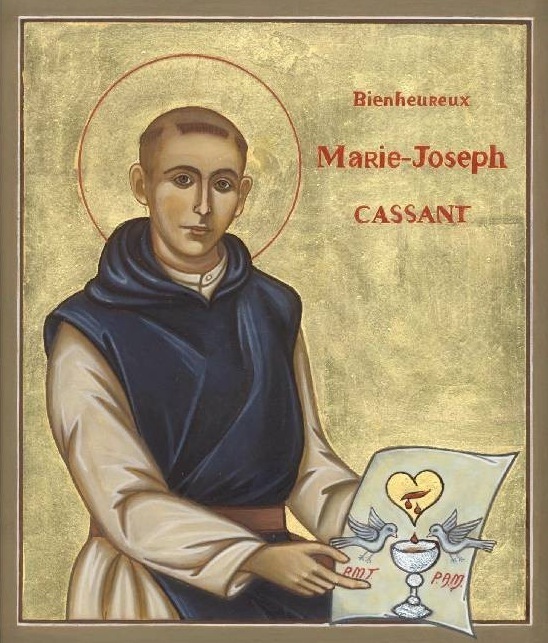 The feast of Blessed Marie-Joseph Cassant, falling in the month of the Sacred Heart and on the day after the feast of Saint Lutgarde, invites us to follow him along the path of confidence in the Heart of Jesus and burning love for the Most Holy Sacrament of the Altar. For Blessed Marie-Joseph nothing equaled the Holy Sacrifice of the Mass; the Mass became his life. 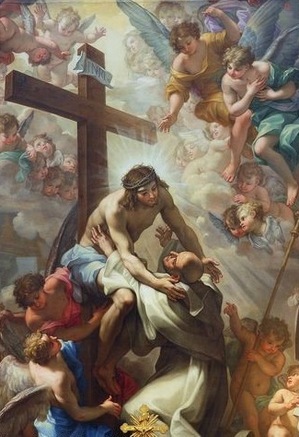 At the hour of death his identification with Christ, priest and victim, was complete. Today, through Christ, with Him, and in Him, he makes priestly intercession in heaven for those who ask for it on earth. June 16th is the feast of one of the first mystics of the Sacred Heart: Saint Lutgarde of Aywières. Some years ago I was given a piece of her wooden choirstall: one of my most treasured relics. Saint Lutgarde was the contemporary of Saints Francis and Clare. She was born in 1182, just one year after the little Poor Man of Assisi. Both were destined to share in the Passion of Christ; both would bear the impression of Christ’s wounds. Saint Lutgarde is often depicted — as are both Saint Bernard and Saint Francis — held in the embrace of Jesus Crucified, and invited to drink from the wound in His Sacred Side. The prolific multiplication of Cistercian-Benedictine monasteries of women in the Low Countries obliged the White Nuns to turn to the newly founded friars, disciples of Francis and Dominic, rather than to their brother monks, for spiritual and sacramental assistance. Lutgarde was a friend and mother to the early Dominicans and Franciscans, supporting their preaching by her prayer and fasting, offering them hospitality, ever eager for news of their missions and spiritual conquests. Her first biographer relates that the friars named her mater praedicatorum, the mother of preachers. Lutgarde is the classic example of “the enclosed nun with the unenclosed mind.” Her deep sense of the Church, her keen interest in the preaching mission of the mendicant friars, both Dominican and Franciscan, made her a greathearted woman, a woman of Catholic dimensions. For Lutgarde, enclosure was no impediment to a real participation in the mission of preaching the Gospel. From within her monastery, she followed the friars in their travels, uniting her prayer and fasting to their apostolic labours. Lutgarde had a compelling insight into Jesus’ words to the apostles after their failure to deliver a boy from an unclean spirit: “This kind cannot be driven out by anything but prayer and fasting” (Mk 9:29). Her seven year fasts on bread and beer make her unique in the annals of holiness. Lutgarde’s first attempt at monastic life was anything but fervent. She went to the monastery dragging her feet, more resigned to the cloistered life than committed to it. Her marriage dowry had been squandered in unwise business investments, making her unattractive to suitors, at least from the perspective of economic advantage. For Lutgarde, as for so many other women of her time, the cloister represented a socially acceptable alternative to the disgrace of unmarried life in the world. One could always play along with the monastic life if one didn’t want to live it, or so she thought. Lutgarde loved the parlour, a welcome break in the monotony of monastic observance. If her visitors were entertaining and handsome young men, susceptible to the feminine charms that, despite veil and grille, she knew well how to deploy, so much the better. Then everything changed. In a blaze of beauty and of love, Jesus Crucified, the Lord of glory, came to the parlour, revealing Himself to Lutgarde, claiming her heart for Himself, offering her a glimpse and foretaste of “what no eye has seen, nor ear heard, nor the heart of man conceived, what God has prepared for those who love Him” (1 Cor 2:9). At the age of twenty, a changed Lutgarde embraced the monastic way, consciously, deliberately, generously. Psalm 26 expresses her experience: “Thou hast said, ‘Seek thou my Face.’ My heart says to Thee, ‘Thy Face, O Lord, do I seek’” (Ps 26:8). That one verse expresses the exchange underlying every call to intimacy with Christ. He says, “Seek thou my Face.” I respond, “Thy Face, O Lord, do I seek.” One who perseveres in seeking the Face of Christ is brought ineluctably to knowledge of the secrets of His Sacred Heart. The Face of Jesus Crucified, perceived in a shocking flash of beauty and of love, impressed Itself upon Lutgarde’s heart. She began to live “hidden in the secret of the Face of the Lord” (cf. Ps 30:21). Psalm 30 contains, in effect, two promises that have given hope to monastics down through the ages: “Thou shalt hide them in the secret of Thy Face. . . . Thou shalt protect them in Thy tabernacle” (Ps 30:21). For Lutgarde, it became clear that she was to live hidden in the Face of Christ and to lodge in the tabernacle of His pierced Heart. When Lutgarde’s sisters chose her as abbess, she was driven by the Spirit to seek a life even more hidden in the Face of Christ, to place her stability in His Sacred Heart. She sought admission to the abbey of Aywières where, laying aside the habit of the Black Nuns, she put on the white cowl of Cîteaux, happy to have found a deeper silence, a more hidden solitude . Lutgarde’s silence was virtually complete. 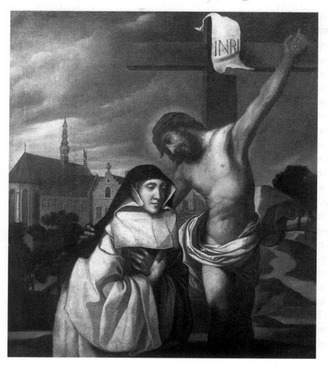 The nuns of Aywières spoke French, not Lutgarde’s native Flemish. Despite her efforts, she found the French tongue impossible to master. Living, working, and praying in the midst of her sisters she experienced a loneliness and solitude that she had never known before. Lutgarde’s health was poor. Fevers and poor eyesight, later turning to blindness, made the austere Cistercian observance wearisome and draining. The same Christ who had revealed Himself to her at the beginning of her conversion, waited for her one night in the dormitory, by the door to the staircase leading into the choir. Crucified and bleeding, His gaze met hers. Removing His right arm from the Cross, He drew her mouth to the wound in His side, the wound opened by the soldier’s lance on Calvary. Lutgarde drank, and drank deeply. The daily Eucharist renewed sacramentally her mystical experience of Christ’s pierced Heart. Like the children of Israel, she drank “from the supernatural rock” (1 Cor 10:4), but journeyed in the wilderness nonetheless. Long hours in choir did little to console her. Her Latin was as poor as her French. Lutgarde’s solitude was complete. The liturgical dialogue with God was as frustrating as dialogue with her sisters. When, in a mysterious visitation, Christ came to Lutgarde, offering her whatever gift of grace she should desire, she asked for the intelligence of the Latin tongue, that she might better understand the Word of God and lift her voice in choral praise. Christ granted her request but, after a few days, Lutgarde began to feel strangely restless, unsatisfied. She hungered for more than the enlightenment of the intelligence. Though Lutgarde’s mind was flooded with the riches of psalms, antiphons, readings and responsories, a painful emptiness, a persistent yearning, throbbed in her heart. With disarming candour she returned to Christ, asking to return His gift, and wondering if she might, just possibly, exchange it for another. “And for what would you exchange it?” Christ asked. “Lord, said Lutgarde, I would exchange it for your Heart.” Christ then reached into Lutgarde and, removing her heart, replaced it with His own, at the same time hiding her heart within His breast. “A new heart I will give you, and a new spirit I will put within you; and I will take out of your flesh the heart of stone and give you a heart of flesh” (Ez 36:26). This mystical exchange of hearts signified Lutgarde’s passage into spiritual maturity. The heart, created for love, is satisfied by love alone, a love beyond all understanding. The road of Lutgarde’s exodus, her particular monastic journey, had been one of loneliness and isolation, of frustration and disappointment until, having given her heart in exchange for the Heart of Christ, she was “filled with all the fullness of God” (Eph 3:19). Who among us can claim to know the gift that will bring peace, deliver from trouble, and satisfy the longings of the heart? Who among us would presume to know the grace of which he or she stands, at this very moment, most in need? I, for one, would fear to choose. The only safe place in the monastic journey is the Face of Christ, the only stability that never disappoints is in His pierced Heart, the wellspring of undying, eternal, indestructible love. The love of the pierced Heart of Christ is given us, freely and abundantly, in the mystery of the Most Holy Eucharist. The Eucharist is the exchange, or rather, the communion of hearts, the Heart of Christ in the Church, the heart of the Church in Christ. May the friendship of Saint Lutgarde and the energy of her prayer accompany us into the presence of Christ’s Eucharistic Heart, and remain with us amidst all of life’s changes, chances, and crossings. October 16, 2012 is the sixth anniversary of my pilgrimage to Paray-le-Monial, la cité du Sacre-Coeur in the company of dear friends. Ma joie demeure. Little did I suspect then that six years later I would be living in a former monastery of the Visitation, where Saint Margaret Mary was greatly loved and honoured. 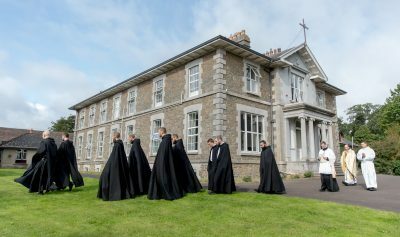 Today that monastery of the Visitation is called Silverstream Priory. When Margaret Mary Alacoque entered the Visitation Monastery of Paray-le-Monial, it was assumed that she, like so many other women, would disappear into the cloister, leaving behind no more than the sweet lingering fragrance of another life given to Christ. But, as always, “God chose what is foolish in the world to shame the wise, God chose what is weak in the world to shame the strong, God chose what is low and despised in the world, even things that are not, to bring to nothing things that are, so that no human being might boast in the presence of God” (1 Cor 1:27-29). The icy wind of Jansenism was blowing through the chinks in more than one cloister. It chilled the heart with the fear of a distant and vindictive God, eclipsing the mission of Jesus sent by the Father, in the power of the Holy Spirit, “to proclaim release to the captives . . . to set at liberty those who are oppressed” (Lk 4:18). While the hearts of many around her grew cold, Saint Margaret Mary fixed her gaze upon the wounds of Jesus Crucified. Like Saint John the Apostle, like Saints Bernard, Lutgarde, Gertrude, Mechthilde, and countless others before and after her, the humble Visitandine of Paray-le-Monial was compelled by the Holy Spirit to look upon Jesus’ pierced Side. “They shall look on Him whom they have pierced” (Zech 12:10, Jn 19:37). 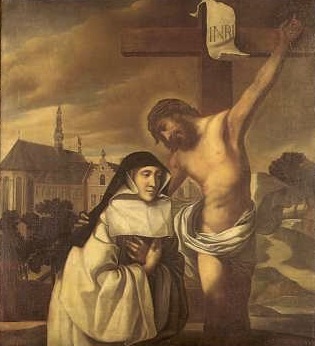 In contemplating the pierced Side of the Crucified, Saint Margaret Mary discovered what many had forgotten: “the breadth and length and height and depth of the love of Christ” (Eph 3:18). It was given her to “know the love of Christ which surpasses knowledge” and fills “with all the completion God has to give” (Eph 3:19). She discovered, moreover, that the open Side of Jesus beckons to all from the adorable Sacrament of the Altar, and that His Eucharistic Heart is, at every moment, ablaze with love. 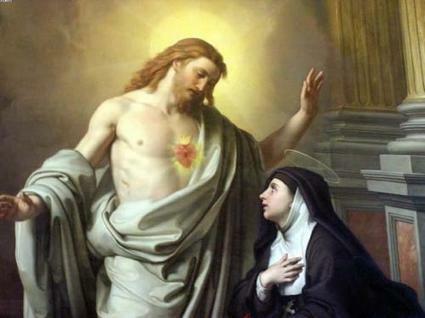 Saint Margaret Mary invites us to re-discover the Heart of Jesus ablaze with love in the Most Holy Eucharist. The Eucharistic Christ, the Christus Passus, abides in our midst as Priest and Victim. There He perpetuates the oblation made first in the Cenacle, and then from the altar of the Cross. In every age souls, like Saint Margaret Mary, have been polarized by the mysteries of the Cenacle and of the Cross actualized in the Most Holy Eucharist. In some way, the Holy Spirit continually reproduces Saint John’s icon of the Church contemplating the pierced Side of Jesus on Calvary: “Standing by the Cross of Jesus were His mother, and His mother’s sister, Mary the wife Clopas, and Mary Magdalene. . . . and the disciple whom He loved” (Jn 19:25-26). The Sacred Heart is at the center of the Most Holy Eucharist both as sacrifice and as sacrament. The sacred action of the Mass perpetuates the Sacrifice of Calvary by which Christ, obedient unto death, hands Himself over to His Father and to those who partake of His Body and Blood. The priestly Heart of Jesus that beats with love in the Sacrifice of the Mass where He offers Himself as Victim, lives and burns with the same fire of love in the Sacrament of the Altar. From the tabernacle, as once from the Cross, He seeks souls to console Him, saying in the psalmist’s words: “I look round for pity, where pity is none, for comfort where there is no comfort to be found” (Ps 68:21). One cannot look long at Jesus Crucified without “the eyes of the heart” (Eph 1:18) being drawn to His pierced Side, and without entering, drawn on by the Holy Spirit, through the door of His pierced Side, into what men and women of every age have experienced as a “burning furnace of love.” The “unsearchable riches” (Eph 3:8) of the Sacred Heart of Jesus, contemplated “for now, as in a mirror darkly” (1 Cor 13:12), are given us, until the return of the Lord in glory, in the adorable mystery of the Eucharist. And so, we go to the altar and to the tabernacle again and again to taste “with all the saints” (Eph 3:18), the “perfect love that casts out fear” (1 Jn 4:18). for they are many that make war against me. Today’s Introit expresses the prayer of a soul locked in spiritual combat with the powers of darkness. Having entered Passiontide, the final phase of the Great Fast, it is inevitable that the Evil One should assault the catechumens, the penitents, the clergy, and all the faithful of the Church, lest they arrive safely in the serene harbour of the Lord’s Passion. It is not unusual in Sacred Scripture to find the Evil One referred to as “man,” particularly in the psalms. The Introit describes his wicked tactics: by afflicting a soul all the day long he seeks to cause a deadly weariness, by fighting against a soul without reprieve he seeks to stir up sentiments of despondency. The soul under attack has but one recourse: to cry out to the Lord for mercy, and to pray ceaselessly with confidence in the victorious love of Christ Jesus. The story of Jonas’ mission to the city of Ninive, with its images of fasting, sackcloth, and ashes, recalls the beginning of Lent on Ash Wednesday. It is not too late to enter into Lenten repentance, not too late to begin one’s Lent with humility and sincerity of heart. The workers of the eleventh hour will not be deprived of their reward at Pascha. “And God saw their works, that they were turned from their evil way: and the Lord our God had mercy upon His people.” (Jonas 3:10). If one has undertaken works of penitence, these are the sign that the grace of Christ is already present in one’s life. Works of penitence do not earn the grace of Christ, they demonstrate its power already at work in the heart. Penance is, therefore, a response to the grace of Christ Jesus and, as such, it glorifies the mercy of the Father and illustrates the secret operations of the Holy Ghost. Today’s Holy Gospel shows us Our Lord Jesus Christ in Jerusalem on the last and great day of the festivity of Tabernacles. On this day, according to the Temple ritual, the priest in service would go to the pool of Siloe bearing a vessel of gold. Having drawn water from the pool of Siloe, he would return to the Temple amidst great solemnity, and there, having mixed the water with wine, he would pour it over the corner of the altar of holocausts. This ceremony recalled the water gushing from the rock during the Exodus and, in a prophetic manner, was a sign of the abundance of graces that would spring from the advent of the Messiah. In the water mixed with wine splashed over the corner of the altar, Jesus sees an image of the blood and water that will flow from His own side opened by the soldier’s lance. He cries out, inviting anyone who thirsts to approach His Heart, the wellspring of living water. One who approaches the Sacred Side of Jesus to drink from its inexhaustible stream becomes a living temple indwelt by the Three Divine Persons. The life of the indwelling Trinity is a fountain in the innermost depths of the soul. The water that springs therefrom irrigates the will, causes the fruits of the Holy Ghost to flourish, illumines the intelligence, and pacifies the senses. All through history, Our Lord has summoned souls to drink from His Sacred Side. Alongside the written commentaries on the Gospels left us by the Fathers and Doctors of the Church, there are iconographic commentaries. These are, in every way, as valuable as those bound between the covers of books. Among the various iconographic motifs in the West that illustrate today’s Gospel, we find that of the amplexus, or the mystic embrace of the Crucified Jesus. In such paintings, one sees Our Lord detaching His arm from the cross in order to place it around His loved one. He guides the head of the loved one to His Sacred Side until, with lips placed against the open wound, the soul drinks deeply of the living water that refreshes, purifies, and inebriates with love. Among the saints depicted in this fashion are Saint Bernard of Clairvaux, Saint Francis of Assisi, Saint Lutgarde, Saint Gertrude the Great, and Saint Paul of the Cross. What these saints experienced mystically is available to us sacramentally so often as we approach the adorable Mysteries of Our Lord’s Body and Blood. Today’s Communion Antiphon, although remarkably brief, is clothed with a rich melodic vesture in the Third Mode. The melody extends the text and, in some way, caresses it, making it easier to assimilate. The text itself hearkens back to the Sanctus of the Mass: Sanctus, Sanctus, Sanctus, Dominus Deus Sabaoth. The Lord of Hosts (Dominus virtutum) of the Communion Antiphon is the Lord God of Heavenly Hosts (Dominus Deus Sabaoth) of the Sanctus. He whose coming is announced in the Benedictus qui venit — Blessed is He who cometh in the Name of the Lord — is the very One who comes to each communicant in the Sacrament of His Sacred Body and Precious Blood. I can only imagine the impression made on communicants when the repetition of this antiphon accompanied the Communion Procession. Him whom you are about to receive, Him whom you have just received, is the Lord of Hosts, the King of Glory, and you have become His temple, His tabernacle, His throne.